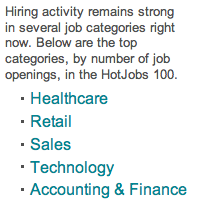 HotJobs has launched the HotJobs100 List. The HotJobs 100, showcasing many of the top U.S. employers, is a great starting point for job seekers who want to know which companies are experiencing robust hiring activity. In other words, HotJobs has taken a look at it’s sales data and seen which companies have the most posted job openings, which industries have the the most posted job openings, which cities, etc. Clearly, this is a valuable resource for job seekers. The idea isn’t to go down their list and immediately send a resume out to the top 10 companies; but getting an overall feel for where the hiring is still happening can help you focus your job search in more fertile fields. Now, as you’ll see if you click through on the link, they offer a wealth of data. The list of top companies can be expanded to show the top 100. Plus, if you click through on a company name, you can go to that company’s profile page and begin to get lists of their most recent openings. But there are more lists here as well. As you can see to the left, they have a list of the top industries based on posted job openings (expandable to 25). This is probably the most useful list in terms of getting a macro picture of the job search environment. And this is where the magic happens. Click on, say, the retail category in this list. Boom! You get a pop up list showing which companies have the most retail job openings. You can do the same thing for each category and can of course click through to go to the company profile page. It gets even better with the list of cities with the most openings. I see that Houston has the 4th most job openings posted. I click on Houston and lo and behold, I get a list of the companies with the most posted Houston openings! I do have one caveat about this list. Simply put, the biggest cities are going to have the most openings. Houston will always have have more job openings than Wasilla, Alaska. Without weighting to account for city size, this is a meaningless statistic. A better list would be which cities have seen the greatest increase in job openings month over month or quarter over quarter. And what good is giving us only a few cities? Tell us who has the most openings in each major metro area! Additionally, they have a list of the top job titles. I don’t know how much value you can get out of this one either. I wouldn’t expect the “top titles” to change very often. There will always be a strong need for “sales reps” “customer service reps” “managers” and the like. Those are just the most common titles in existence. Still, if you click on, say, “Nurse” you can find out which companies have posted the most openings for nurses. That’s great if you have a job title that falls into the top 25 or so… why not expand this out to the top 100, say? The final two lists are more interesting. The Top College Job Companies list promises to tell you which companies are most aggressively seeking recent college grads to recruit. I can’t tell you how valuable that sort of information could be for grads, provided the data is accurate and reliable. Finally, the Top Part-Time Job Companies could be extremely valuable to, of course, those people looking for that category of work. Overall, this is some great info. As I say, I can’t believe no on has done something similar in the past (before I get the emails, yes, I know about Indeed’s Job Trends… I just think this is a more valuable and simpler tool). A true holy grail would be to give us more information broken down into finely sliced and diced categories and locales. For example, which companies have the most posted openings for, say, Accountants in Seattle? And they could tweak the data by showing us percentage increases in some areas. As great as it is to know what industry or city has the most openings, it would be double great to see which industries or cities are growing the most. Cause where the growth is is where you want to gravitate to in your job search. They have the data. They just have to be willing to share it. So a word of advice to HotJobs (or anyone else, for that matter). Look at the example of Google. If you provide users with a way to parse and organize data, you provide them with a valuable service. All the job boards provide lists of openings. But if you provided a comprehensive set of tools to help a job seeker search the data your have more intelligently… well, you’d certainly stand out as a service. Let’s say I’m an Architect in South Florida and I know I need to move elsewhere because the housing bust means there’s not a lot of work to be had down south. Which areas of the country, cities, companies etc. have the most openings for Architects? Job Boards: like Google, you’ve got the data in your servers. Let me at it! Don’t just give me lists of openings… give me tools to organize those openings in ways that will allow me to be a more intelligent and efficient job seeker. Let’s hope they expand this page in the future. In the mean time, take the time to study the lists and glean what job search intelligence you can.